SYNOPSIS: After challenging an evil dragon, rescuing a beautiful princess and saving your in-laws' kingdom, what's an ogre to do? Well, if you're Shrek, you suddenly wind up a domesticated family man. Instead of scaring villagers away like he used to, a reluctant Shrek now agrees to autograph pitch forks. What's happened to this ogre's roar? Longing for the days when he felt like a "real ogre," Shrek is duped into signing a pact with the smooth-talking dealmaker, Rumpelstiltskin. 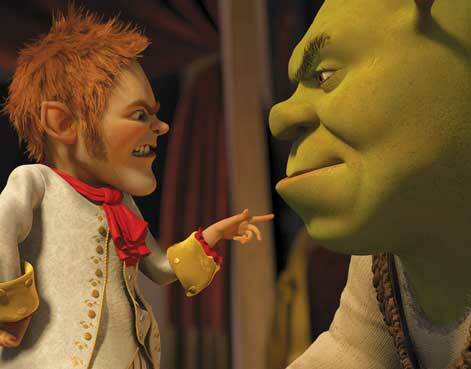 Shrek suddenly finds himself in a twisted, alternate version of Far Far Away, where ogres are hunted, Rumpelstiltskin is king and Shrek and Fiona have never met. Now, it's up to Shrek to undo all he's done in the hopes of saving his friends, restoring his world and reclaiming his one True Love. REVIEW: The original Shrek surpassed expectations and created a group of charming characters that became the face of Dreamworks Animation. A decent second film that saw the addition of franchise’s more popular character Puss in Boots, which became the favorite of many. The sequel was followed three years later by a disappointing third entry in the series, putting in jeopardy the continuity of our lovable ogre in the big screen. However with the help of faithful fans and a super healthy box office run, paving the road to a fourth and final chapter, that manages to deliver the laughs, charm and adventure missing since the series was release, nevertheless it is still lacking the originality of the first film. In this new chapter Shrek is under a heavy stress trying to cope with its new life as a father of three new born, whishing he was able to go back in time to the good old days. His life is turn upside down when his whish become a reality, only to realize how much he has lost. Sounds familiar? Yes, it does. Take for example “Mr Destiny” or “It’s a Wonderful Life” same dilemma, same outcome. Unfortunately that's the area where “Shrek Forever After” disappoints, by show lack of originality. Regardless of the story the film still has plenty of action, jokes and a few grown up comedy lines that makes this film good family entertainment. Most of the entertainment came from the usual suspects, Puss in Boots and Donkey. Also from the new villain Rumpelstiltskin voice by Walt Dohrn, character that brought back Lord Farquaad’s memories. The visual aspect of the movie is golden and the animation is one of Dreamworks’ best. Nevertheless there is not an evident improvement in the animation. The same can’t be said about the 3D technology, which doesn’t seem to add any value to the film. There are only a couple of scenes in which is evident the 3D, other than that people can just watch in 2D and save some money. Overall I found the film familiar, with enough material to make it worth watching. Its 93 minutes of family fun, so is definitely recommend it for family night. Your kids will be giggling about it for days and you won’t mind having to watch it more than once for their amusement. There is only one question left in the air. Is this film really Shrek’s final chapter? I have the feeling that is not.